Dogs and Children. 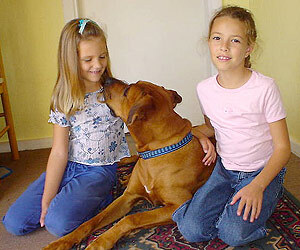 Dog Training for Children. Does Your Dog Obey Your Child? Pam's revolutionary pro-family work with dogs is a much needed contribution to both enhancing the dog owning experience and improving the quality of living of the domestic dog - by showing families how to teach their dogs to fit in with them and their life-style. The very much needed angle of Pam's unique approach goes further than making the dog fit in with the family - she makes the dog fit in with the youngest member of the family. Every other approach to dog owning gives families a pet that is so fit, powerful and agile that they frequently run small children over when running accross the lawn or down the passage, or bump into them, jump on them, take their balls when they want to play, run off with babies dummies... in fact the dog is so fit that the whole family has to go to the gym to keep up with the dog - then they all have to go to a farm - when they might just as well have owned a user-friendly dog! So when families learn these simple, natural leadership and communiation principles - as opposed to bullying dogs into submission - not only can the child apply these principles, but the dog can be totally trusted with all children because he is not learning what is in reality, aggressive behaviour, through example. Dogs only submit because they have been turned cowardly, and as we all know (and so does Hollywood) - cowards cannot be trusted. 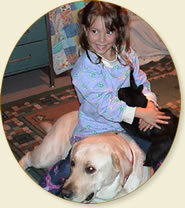 Pam also works with children who are afraid of dogs, giving them confidence with these simple and powerful techniques around dogs that appear threatening to them by placing them in the power-seat by empowering them not to be victims any longer. Click here to contact Pam - Phone Pam: 083-485-5369. If they were not so human, we would not be able to enjoy such deep and meaningful relationships with them. Because that is what dog owning is – another relationship. And because dogs are so human, we can learn so much from the Laws of the Jungle that govern social behavior within a pack of dogs. And these Jungle Laws - which bring peace and harmony into homes - are not for sale in the mainstream market place. Healthy relationships in a social community such as humans, wolves, dogs, are built on mutual respect, mutual trust, communication, loyalty, love, empathy, self discipline, etc. Without each of these, a relationship is not healthy. Nature’s Formula for a mutually rewarding relationship requires us to consider the needs and feelings of another, tact and sensitivity the ability t o see the viewpoint of another, to meet one another half way and to put up healthy personal boundaries that send messages of self respect. Dog owners report back to me over and over, one after another, that they have applied these interpersonal skills in their families, in their work place and in all their relationships – with awesome and empowering results. Through learning about the natural laws that govern dog behavior, we are able to learn how to get into mutually enriching, non abusive relationships with one another - because all communities are designed to live according to the same basic principles that govern leadership and harmonious social interaction. But the secret is – not to study dysfunctional packs of wolves and wild dogs where there is shortage of food, and human interference. Leadership is not about who wins a dog fight – it is about trust, win/win situations, and leading by example. Dominating and submitting occur in abusive- not in healthy relationships. The Laws of the Jungle where famine does not exists (why copy famine conditions??) go beyond obedience - into cooperation. And beyond happiness - into contentment. Where there is cooperation and contentment – there is harmonious coexistence and mutual trust. The community is governed by a well established and respected moral code – not through dog fights. Applying these principles not only give immediate results, but also long term solutions. They are older than history - yet as up to date as tomorrow. So – according to the Laws of Nature, you cannot go wrong if you treat your dog like a child! It is never right to dominate and verbally abuse children, give them commands, lock them up, keep them hungry, feed them only processed take aways and food they do not like, and pick up their food while they are still eating…. When dog owners are taught how healthy interpersonal skills and correct communication and leadership (not dictatorship) techniques – everything else falls into place. Cooperation becomes a choice - it is beyond obedient. Contentment is made possible – it is beyond happiness. Children benefit so enormously from the life skills that they learn from the Natural Principles that govern harmonious existence in the Jungle (both green and concrete) - skills that show them there is no need to be either a victim or a bully in any relationship, and they then take these skills into their future relationships in their adulthood with them. I know, because I get their cards, letters, phone calls and emails! Natural Dog Trainer, Pet Consultant, Ethologist, Social Sciences, Author, Producer of Home Training movies. Endorsed by the Plastic Surgeons Association, the Child Accident Prevention Trust, and used by Denel Land Mine Dog Sniffers. Consulted by leading international dog trainers, behaviour therapists and medical research scientists. One is from our perspective, and the other is from the dog’s perspective. One is to impose human logic onto our dogs, and the other is to learn how a dog’s instincts and communication system work. One is to adjust to them, and the other is to get them to adjust to and fit in with us. One is to give them everything they want, - so that they become increasingly demanding. And the other is to give them everything they need, so that are calm and obedient through having peace of mind, and the security of being understood. This makes them much better watch dogs, now able to protect their families instinctively. It is either one or the other. Natural dog training does the latter. The former turns dog owners into well trained consumers, the latter gives families the control over their dogs that they are needing. If Natural Dog Training is what you are looking for, then let me know, and we can work out a programme for you and your dog. If you are really serious about understanding your dog on a deeper level, you will need to do some UNlearning (the marketing propaganda) before you can RElearn the fascinating and simple Laws of the Jungle which govern a dog’s behaviour . 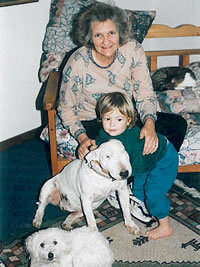 Pam Whyte trains dogs in Somerset West, Cape Town, all over South Africa - Johannesburg, Pretoria, Durban, and in US.A. - America, Australia, U.K. Canada, Europe, Ireland, Wales, Scotland.